Mobilink held a prize distribution ceremony at Mobilink Office Islamabad, to conclude the “Mobilink Super Engineer Competition”. 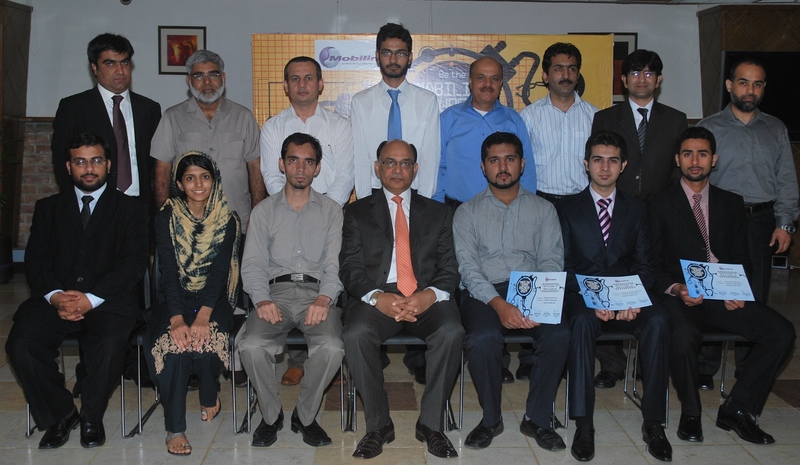 The title was won by students from Ghulam Ishaq Khan Institute of Engineering Sciences and Technology. Securing 1st position with their project, “Traffic Analysis and measurement system in IPMPLS Environment” the 5-member team from GIKI was thrilled. The team representing NUST University took the 2nd position, with their project, “Inter-city video conferencing system” while the 3rd position was taken by the team from FAST University with their project, “Automation of physical distribution of E 1s”. An inter-university contest involving teams of students from the leading engineering universities of Pakistan, Mobilink Super Engineer Competition provides the students the chance to work on a real life project with technical experts from Mobilink’s team. The projects were evaluated by a senior Mobilink jury having representation from different Technical departments against a pre- defined criterion of innovation and creativity, project presentation, meeting the timelines and meeting project objectives. Rashid Khan, President & CEO Mobilink, awarded the teams with shields and certificates in the presentation ceremony held at the Mobilink head office. He appreciated the efforts of the participating teams and assured the winning team of opportunity of employment assessment within the Technical division at Mobilink. In addition to mentor programs, Mobilink also provides grants at Bachelor and Masters level for students of LUMS and GIKI. Mobilink also launched an innovative SMS Literacy project for rural women in partnership with UNESCO to improve the reading and writing skills of semi-literate women using cellular technology. woh motorollA WALI POST KAHAN GAI. I was representing FAST university in this competition and certainly it was a great experience for us working with the mobilink’s technical team. This competition provided us an opportunity to test our theory into the practical world. Being telecom engineers we had studied most of the GSM network architecture but seeing Mobilink’s own network we learned how things are done in the practical world. Apart from technical knowledge we gained a overall self grooming and a flavor of coperate environment. I’d like to thank the whole Mobilink team for initiating this competition and hopefully it will be continued in the coming years. i am ahabib student of sirsyed university. totaly agree with sania coz i think this is partiality by not offering other universities to participate in it.